JHS Pedals Pollinator Review – Best Germanium “Fuzz Face” Pedal? Guitarists have been chasing that classic “Fuzz Face” sound for over 40 years. And while various iterations of “Fuzz Face” style pedals are still being released, many guitarists feel that few of the modern incarnations capture the same mojo as the original vintage units. 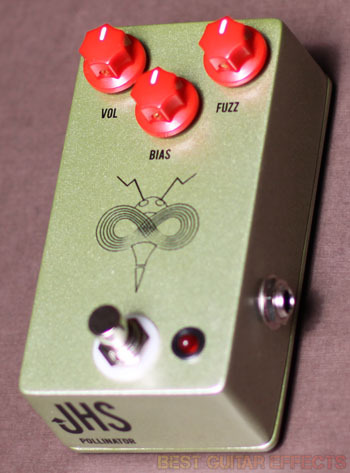 But leave it to Josh over at JHS Pedals to put his own spin on a timeless classic and tackle the monumental task of creating a “Fuzz Face” clone that’s actually worth playing. 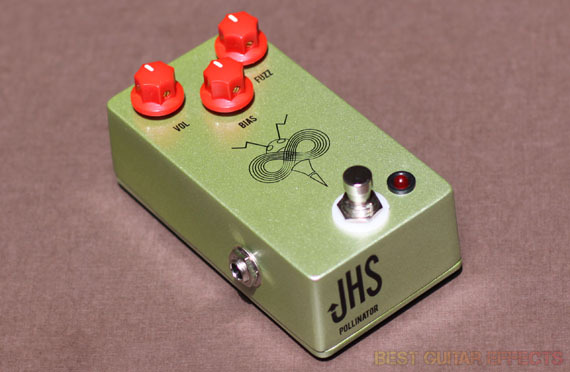 The JHS Pedals Pollinator features two perfectly hand-matched Germanium AC128 transistors and huge improvements over the original “Fuzz Face” design such as more output volume and an external bias knob. It promises a tight, yet classic bass response with crisp top-end comparable to the highly sought-after vintage designs. Okay, this all sounds good so far. But does the Pollinator live up to the hype? Is it the best Germanium “Fuzz Face” pedal available today? You’ll find out in our JHS Pedals Pollinator review. But first let’s run down the benefits of this pedal. 2 hand-matched Germanium AC128 transistors. Control knobs for Volume, Fuzz, and Bias adjustment. 3 times as much headroom as an original “Fuzz Face”. Clean up with your guitar’s volume knob. Visit JHS Pedals for more info about the Pollinator. I plugged in my Strat with the Pollinator in front of a clean amp and dialed the knobs to noon. Then I fired up the pedal. The Pollinator produced a clean sound with some of the high-end rolled off a bit. It’s a bit warmer than your dry sound but not too dark. Pushing up the Volume knob will let you find a nice unity gain level or achieve a boost to push your amp a little harder. Rolling the Bias knob to the extremes produces a subtle, but noticeable changes in response. While not typical of how fuzz pedals are generally used, the Pollinator produces a surprising amount of playable, lo-fi, vintage sounding clean tones. But things begin to get much more interesting when you start pushing up the Fuzz knob. Taking the Fuzz up to around 3 o’clock gives you some great overdrive characteristics, fattening up your sound with some nice Germanium overdriven grit. The Pollinator can get dirty when you play hard, responding exceptionally well to your playing dynamics, but it retains note definition and clarity. Despite its apparent simplicity, you can tell a lot of attention to detail was into this pedal. The Pollinator is a very expressive pedal, a must-have for players who have an appreciation for dynamics and also like to use their guitar’s volume knob to control their output level and drive tones. There’s a threshold to be found in the Fuzz control around 4 o’clock where the Pollinator goes from mild and refined to “all out”. You can max out the Fuzz knob to find that classic psychedelic fuzz sound. This is it. Just adjust the Bias to find the response you prefer and see what sounds good to your ears. Although some highly reputable builders argue that AC128 transistors fail at achieving authentic 60’s “Fuzz Face” tones, the Pollinator does a commendable job at getting great Germanium fuzz sounds when judged on its own. The Hendrix-chasing purists may find better fuzz pedals if they’re looking for absolute authenticity, but the Pollinator still sounds pretty great to me. I personally really like to crank the Pollinator right to the breaking point without pushing the Fuzz over the edge. This allows the Pollinator to produce plenty of gain while still remaining very tight and focused. And it still cleans up as well as any of the best overdrives around. I even like it around this setting for dirty amps, too. The Pollinator works well with overdriven and high-gain amp sounds to produce an extra heaping of sustain and fat Germanium flavor for some very inspiring lead tones. It’s also worth noting how the Volume control affects this pedal. While the original “Fuzz Face” pedals were a bit lacking in output volume by today’s standards, that isn’t an issue with the Pollinator. You can achieve a subtle boost in volume for solos or crank the Volume to slam the front end of your amp with an explosively hot signal. I enjoy a more unity gain setting for going from clean to fuzz without a drastic spike in volume. 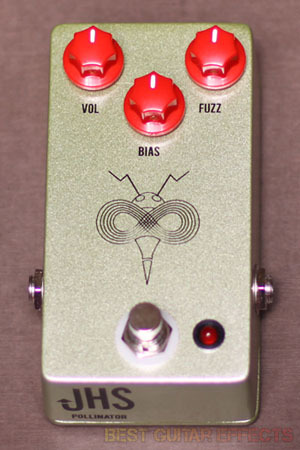 The Pollinator also works well with distortion without adding excess noise and feedback. It’s great for stacking. But whatever your style, the Pollinator provides a great vintage vibe that can be easily tailored to your needs. On a side note, it’s good to dial in the Bias knob each time you play the pedal as it seems to change with the weather. The old units were notoriously susceptible to temperature changes. The Pollinator is a living thing, sensitive to its environment and surroundings, and it becomes an extension of the guitarist playing it. I’ve gotta say, the Pollinator is one of my new favorite fuzz pedals. JHS have plenty of solid guitar pedals of the fuzz variety, including the Mini Foot Fuzz, Bun Runner, and 4-Wheeler, but they really have a winner with this one. Let’s see the final result. The Pollinator from JHS Pedals is one hell of fuzz pedal for anyone seeking that classic Germanium fuzz sound. This is one of the most playable fuzzes around, offering plenty of great sounds in its dead-simple controls. If you’re the kind of guitarist who appreciates dynamics and likes to use your guitar’s volume knob to control your clean and dirty tones, the Pollinator should be at the top of your must-try list. This is one of those pedals you find yourself loving more and more each time you play it. Looking for the best Germanium “Fuzz Face” pedal? The JHS Pedals Pollinator may just be the one. That concludes our JHS Pedals Pollinator review. Thanks for reading. 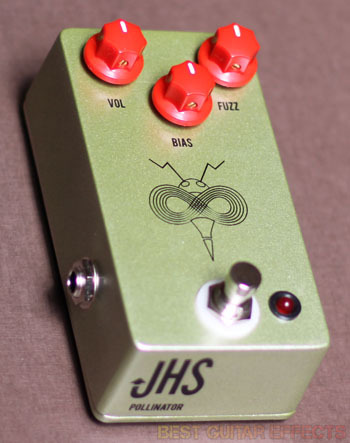 Want to buy the JHS Pedals Pollinator?